page of the "Caymanian Compass"
Link to article in "Caymanian Compass"
It’s a pretty safe bet HRH Earl of Wessex Prince Edward will return to his homeland with a bit more Iguana savvy. He got his education in a perfectly Caymanian way while he visited here last week – on a roadside in East End. It was there the Earl met the people involved in the Cayman Islands Blue Iguana Recovery Programme. 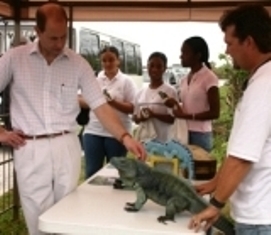 Programme Director Fred Burton said the Prince was surprised his meeting with the group was along the roadside; the departure point for three students to hike into the Salina Reserve and release three young iguanas in honour of the prince’s visit. But before the trek in the bush, the Prince had some questions for the youngsters. He asked about the coloured beads on each animal’s neck. Mr. Burton said these were for visual identification at a distance, backed up by microchips implanted in every Blue Iguana that passes through the programme and high–resolution photographs of their head scales. The scales are unique to each animal as fingerprints are to people. Adult iguana, Pedro, then caught the Prince’s eye. Mr. Burton said he had the impression the Prince was surprised that Pedro is so immobile. Pedro has a congenital and incurable eye problem, which means he cannot see well, which means the animal can safely be taken to such an event as meeting a Prince. Mr. Burton told the Prince the programme has seen remarkable success in recent years, breeding at its facilities at the Botanic Park into and releasing over 200 young iguanas the Salina Reserve. But the programme will grind to a halt soon unless additional dry shrubland, the iguana’s habitat, comes under protection. For all its 625 acres, the Salina Reserve has only 88 acres of dry shrubland and that is nowhere near space enough for the 1,000 Blues that must be restored to the wild to get this species off the Critically Endangered List. Mr. Burton said the Prince took that on board and observed that while he perhaps wasn’t in the best position to do anything about that, he understood how important it was and imagined that others present saw this too. The Prince then asked the three girls how they were involved in the programme. Gloria Borden, Melissa Smith and Chantal Pearson said they had raised funds for iguana sponsorships and releases over the last three years. They also talked about a new poster John Gray High School Recyclers are producing with funds from CUC to show the differences between Common (Green) Iguanas and Blue Iguanas. The Prince was shown the release location in the Reserve on the maps. He was also shown an example of the wooden retreats that the iguanas would be released into, and how these work to encourage the iguanas to set up territories within the protected areas where they are safe. One of the young iguanas started to wriggle out of its bag, Mr. Burton related, so as he assisted in securing it he was able to show the entire animal to the Prince and also to Mrs. Susan Olde, a member of the touring party who was particularly interested. Finally the Prince was drawn back to Pedro, who suddenly got bored with standing still and tried to climb up on Chris Carr, the Iguana Warden that had been holding him. Mr. Burton said they took the opportunity to show the Prince the unusual ways the Blue Iguana toes are articulated to be efficient in digging and climbing trees, and to show him the femoral pores on the male’s thigh, which are used to release pheromones, and which are useful for people to tell the males from the females. “By this time the Prince’s scheduled 10 minutes had extended to something closer to 20, so he warmly wished us luck and ongoing success, and the party went on their way,” Mr. Burton said.